Uwell brought us the popular Crown tanks, as well as the Uwell Valyrian, one of the most praised sub-ohm tanks. When I think of Uwell, I think of their sub-ohm tanks more frequently than their mods and kits, only because it seems their atomizers have won them the most recognition. I came across the Uwell Hypercar 80W Starter Kit thanks to a friend of mine. Although this kit claims to be for both an MTL and a restricted DTL, the Whirl tank is really a MTL tank. Is this kit really worthy of praise? Or is it a let down? The Uwell Hypercar 80W TC Starter Kit looks like a sleek, expensive car. It’s not the most unique design I’ve come across, but it makes a nice impression. It fits very easily in the hand and it’s got a nice amount of venting on the sides of the mod to prevent the battery from getting too hot. On the front of the mod is an oversized firing button, a 0.96-inch display screen, two adjustment buttons, and a micro-USB port. You’ll find the battery door, for a single 18650 battery, on the opposite end of the front face of the mod. In fact, basically the entire back end piece comes off to reveal the battery compartment. The magnets hold well, but there is a slight jiggle. There are several colors available: red, gold, sapphire blue, silver, and black. All of the colors correspond well with the car theme they’ve tried to create, so good consistency in my book. The Hypercar is a solid piece of vaping equipment. It’s crafted out of zinc alloy, outputs anywhere from 5 to 80W. The output voltage is 0.7-8v and it has a 0.1-3.0ohm resistance range. The Whirl sub-ohm tank is made of Pyrex glass and the 510 connection is gold plated. It fits nice and flush on the mod without any overhang, but it’s a 24.2mm tank. If you want to use any tank that’s above 25mm, such as an RDA or RTA, you’re going to have some overhang. Although most starter kits are somewhat straightforward, the Uwell Hypercar has a few different functions that differ from the norm. It’s five clicks of the firing button to turn the device on. Then, you’ll see the display screen go on. The screen can be flipped in either direction. To do this, hold both of the adjustment buttons down until you see the display rotate. You can lock the Hypercar and remain vaping (press and hold the fire button and the ‘+’ button simultaneously). You can also lock the mod to prevent vaping (press and hold the fire button and the ‘-’ button simultaneously). The Uwell Hypercar 80W TC Starter Kit offers standard power mode, bypass mode, and TC mode with a range of 200-600°F. For those who are mainly TC vapers, be aware that the TC suite on the Hypercar only allows for stainless steel and NiChrome builds. For some reason, Uwell decided to leave Titanium out of it. The Whirl tank has a stainless steel construction and a 3.5ml juice capacity. It has an adjustable airflow on the bottom, but it’s a single airflow slot. This is because instead of a wide-open airflow, there are five incrementally-sized holes. The top fill system is a threaded one, meaning you’ve got to unscrew the top cap to access the fill ports. The Uwell Hypercar Kit comes with two coils: a 0.6-ohm dual coil (for 18-22W) and a 1.8-ohm single coil (for 10-15W). These are both NiChrome coils, so they work for both TC and Power mode. These are a plug-and-pull system of coils, held in place by o-rings. To replace a coil, just pull it out and, essentially, “plug in” a new one. If you ask me, the Whirl sub-ohm tank from Uwell is just about the best part of this kit. For MTL vaping, this tank does very, very well. And the flavor you get from it is really nice. As a DTL tank, it really doesn’t work as well. It’s too restricted, and if you’re a sub-ohm DTL vaper who prefers a loose draw, that’ll be a let down. But, you can switch out your tank and use a sub-ohm more suited to DTL vaping if you wish. I tried using my Freemax Fireluke Mesh tank and it worked very well, even chucking out some decent clouds at 80W. The NiChrome coils gave a very nice flavor, and an excellent MTL experience, but even with the airflow open, exposing all five holes, the draw was simply too tight for a true DTL vape. The TC suite functions well, even with the Whirl tank’s coils. I switched out an RDA to give it a real try with custom builds, and I didn’t have many complaints. Good flavor, nice performance. If you like to vape at wattages higher than 40, though, the battery life will not last. This is a single 18650 powered kit, so it stands to reason that you’ll be needing to recharge that battery fairly quickly with extensive use. A Win or a Lose? Who Will Like the Uwell Hypercar 80W TC Starter Kit? I don’t have many bad things to say about the Uwell Hypercar Kit as far as function, except that most vapers who prefer DTL aren’t going to like this “restricted DTL experience.” This kit works well for DTL vapers if they plan on switching out the tank, but I really think this kit is meant for MTL vapers. Another odd quirk, though, is the inability to adjust the wattage in TC mode. Might not be a big deal for some, but for others, that could really be annoying. The Whirl tank is great, if and only if, you prefer an MTL vape. You do get some excellent flavor and the TC suite works very well, even though they didn’t include the ability to use Titanium builds. I would recommend this kit as a good option for beginning vapers and intermediate vapers looking to upgrade to a better MTL style vape kit. If you’re only a DTL vaper, I can’t imagine why you’d buy this when there are so many other options out there. Since I like to vary my vaping style, I was able to thoroughly enjoy the Hypercar and Whirl tank combo for what they are—and that’s a very nice MTL vape. 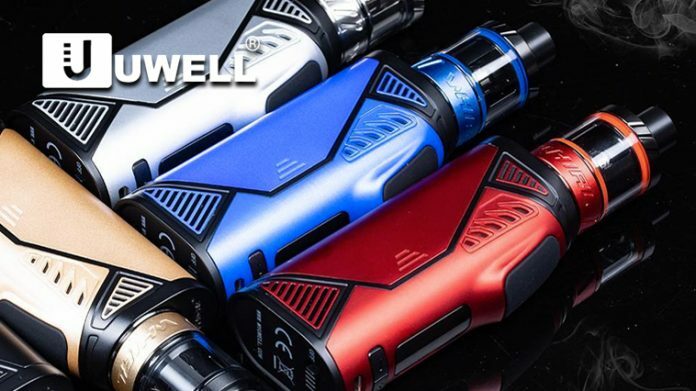 Purchase the Uwell Hypercar 80W TC Starter Kit here.